This series of units offer a flexible, versatile, and economical solution to a wide range of applications. From Data-Acquisition, process control, test and measurement, to energy and building management. 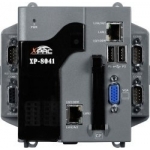 The PAC-8000's can be used as an intelligent distributed data acquisition front end connected to a Host machine running a standard SCADA package, or alternatively it can be user programmed as an autonomous controller running an embedded software application. Significant non volatile memory is available for data and program storage. To enhance the use of these PAC's, we also have a range of Touch Screen Monitors. For distributed HMI displays and to operate as controllers in their own right, we have the latest TouchPAD range. ViewPAC combines a HMI display, with Programmable Controller and I/O Slots for Data Acquisition. High Speed Parallel Bus Data Acquisition Units for use with the PAC-8000 series Controllers. The I-87000 Analog input modules are a range of modules providing analog measurement capability for various sensor inputs. The Serial (RS485) Plug-In units for the I-8000 range of Modular Data Acquisition Units have slower communications speeds than their Parallel counterparts, but support more functionality.